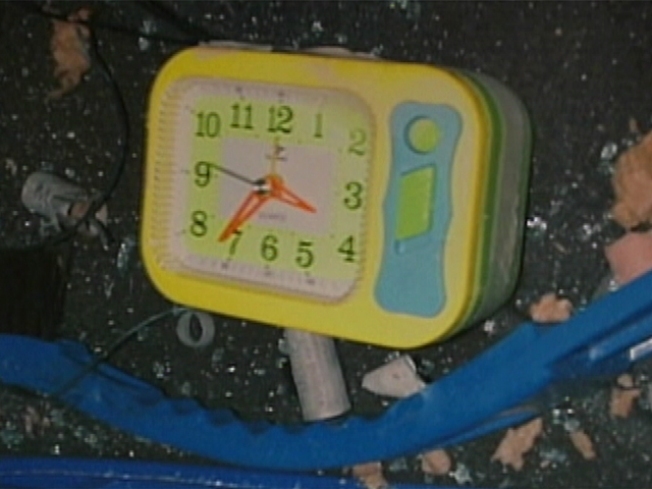 Times Square Hero: "I Wondered Why Nobody Noticed"
Police say two of these alarm clocks were connected to the explosive materials in the SUV. Sometimes, people used to tell Lance Orton not to be such a busybody, but the Vietnam veteran and Times Square T-shirt salesman can’t help it. When he sees something wrong, he has to report it. Nobody’s complaining about Orton now, not after he alerted a mounted policeman when he noticed smoke coming from a parked SUV in New York City Saturday evening. Inside the vehicle were the makings of a crude firebomb — propane tanks, gasoline, fireworks and alarm-clock detonators. The vendor is being hailed as a hero who may have saved uncounted lives through his alertness. Orton was wounded in Vietnam and gets around with a cane. He said he was sitting next to his wares when he saw a Nissan Pathfinder parked with its emergency flashers on and its motor running. A small amount of smoke was coming out of it. The hero vendor said he didn’t see who got out of the vehicle because of a performance on the other side of the street. “I was distracted by the crowd,” he said. But then he saw the vehicle. “I wondered why nobody noticed it,” he said. One of Orton’s helpers suggested calling 911. Orton said he pointed at mounted police officer Wayne Rhatigan, who was on duty in Times Square. When popping noises and flashing sparks came from the car, Rhatigan quickly led police in, moving pedestrians to safety and clearing traffic so that the fire department and bomb squad could neutralize the bomb before it exploded. “Whoever did this luckily did an amateur job,” Orton observed. Another vendor named Duane Jackson also noticed the smoking vehicle and alerted police. Jackson ended up doing numerous interviews and having dinner with Mayor Michael Bloomberg and Officer Rhatigan at a Times Square restaurant, but Orton brushed off pleas for interviews and passed on dinner with the mayor. Police have released a surveillance video showing a man who may be in his mid-40s taking a shirt off a short distance from the SUV, which was parked at West 45th Street and Broadway. He has a red shirt on underneath. The man glances in the direction of the SUV and walks off. Police have named the unidentified man as a person of interest. Secretary of Homeland Security Janet Napolitano, in an earlier appearance on TODAY, said the man is not an official suspect. Although New York police have said the bomb was not the work of the Taliban or other foreign terrorists, Napolitano said nothing has been ruled out.